John G Crawford, Anglicizing the government of Ireland: When Thomas Radcliffe, then Lord Fitzwalter, arrived in Ireland in 1556 as lord deputy, he initiated the slow process by which new English political institutions were grafted on to the existing structure of Irish government. 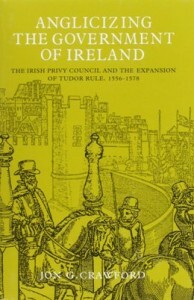 Working through the privy council in Ireland, a succession of lords deputy implemented a star chamber jurisdiction for the council itself; installed a new secretary of state for Ireland; created the lords president and councils in Munster and Connacht; managed reform of the coinage; and supervised changes in the administration of the military and the collection of revenue. The council in Ireland, which already possessed long executive experience, now added importantly to its extensive administrative responsibilities. Nevertheless, when the innovations in government increased the charges to the crown without producing dramatic results, the queen and privy council in Westminster progressively emasculated the rights of the Irish council to act independently. This is the first detailed, full-length study of the privy council in Ireland. The constitutional position of the council is examined, including its membership and organisation; its relationship to the crown and to the lord deputy; and the interplay of personality, politics and patronage on the council itself.